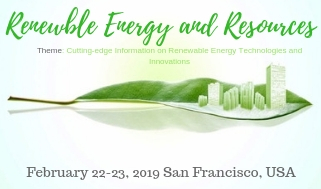 This highly exciting 3rd International Conference on Renewable energy and Resources is intended to be a forum, discussion and networking place for academics, researchers, professionals, administrators, educational leaders, industry representatives and Business leaders. Meet Inspiring Speakers and Experts at our 1000+ Global Events inclusive of 300+ Conferences, 500+ Workshops and 200+ Symposiums every year on Pharm, Medicine, Science and Technology. Theme of the Conference is: “Cutting-edge Information on Renewable Energy Technologies and Innovations ”.